With SHOT Show behind us, we wanted to take a look at some of the most exciting guns and gear coming out this year. Below, our writers have put together a list of the gear that they really want. Take a look, tell us what you think in the comments below, and maybe you’ll find something in here that will go on your “must buy” list as well. The SIG Sauer P365 was the star of SHOT Show, and you’ll see it on everyone’s list of great floor finds for good reason. While smaller guns are often preferred for concealed carry because their size and weight make them easier to tote along and hide, they come with a compromise: they’re usually harder to shoot and have limited capacity. The P365 solves both of those problems. It’s a striker-fired 9mm micro-gun about the same size as the Glock 43 or Smith & Wesson M&P Shield, depending on whether the optional extended magazine is used on the P365. In all three current configurations – flush-fit magazine, pinky-grip magazine, and extended magazine – its recoil is easily controllable even when shooting higher powered +P ammunition. And those magazines? They hold an astonishing ten rounds normally and twelve rounds in the extended version. That gives you the ability to carry eleven rounds of 9mm in a palm-size package and thirteen in something not much bigger. Normally, guns in the same size range as the P365 hold five to eight rounds in their cylinders or with flush-fit magazines. Having 50-100% more ammunition available is no small thing in a small gun. 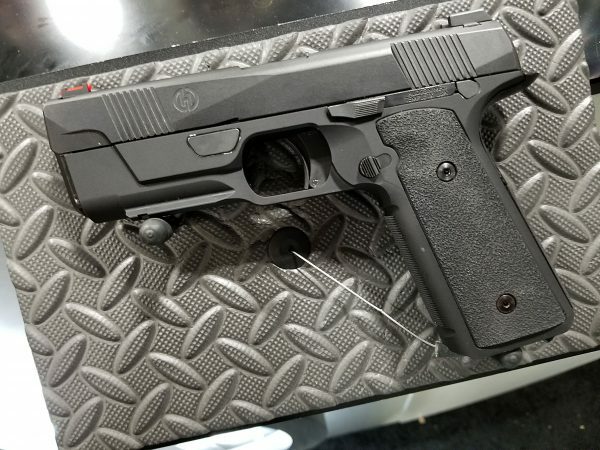 Hudson Manufacturing took the firearms industry by a storm last year when they introduced the Hudson H9. Designed from ground-up to be a slim, ultra-low-bore-axis, striker-fired pistol, it took many common gun design and aesthetics norms and turned them on their heads. 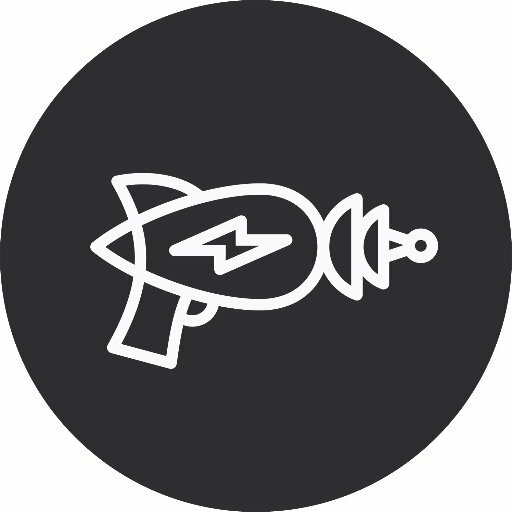 The result was an unusual, almost retro-space-age gun. And as advertised, its recoil was impressively flat. Despite some manufacturing challenges, Hudson brought the H9 to market in 2017 and it’s received a warm reception. They didn’t rest on their laurels, though, and introduced a new version of the gun at this year’s SHOT Show. It looks exactly the same on the outside, but it’s lost a little weight by trading the steel frame for aluminum while retaining the steel chassis. It’s called the H9A – A for aluminum, of course – and it’s expected out later this year. The H9A is eight ounces lighter than the original H9, but retains all of the features that made the H9 attractive. And in shooting the two guns back to back, they recoiled almost exactly the same. It’s clear that the recoil characteristics of the H9 are inherent in its design, and the H9A now brings those characteristics to a lighter gun that will be less effort to carry and more suited to certain shooters and shooting styles that favor less weight in the gun. The 10/22 Takedown is a very popular extension of the classic Ruger 10/22 rifle. It uses a simple mechanism to allow you to literally split the rifle in half so that it’s easier to transport and store. There’s no loss of functionality or accuracy from the base rifle, even after taking it apart and putting it back together multiple times. It makes for a great plinking or utility rifle, but it’s ultimately still in .22lr. Meanwhile, pistol caliber carbines are becoming an increasingly hot item in gun stores. They’re rifles, but shoot larger pistol calibers, so they’re easier to shoot accurately than actual pistols while having a lot less recoil (plus they cost less to feed than actual rifles). That makes them both fun and practical for a variety of applications ranging from home defense to competition. Besides sharing ammunition with your pistol, pistol caliber carbines can sometimes share magazines with your pistol, too. This year, Ruger entered the pistol caliber carbine game with its Takedown PC Carbine. Not content to just make a rifle that uses standard pistol magazines for Rugers and Glocks, Ruger borrowed from its 10/22 Takedown to create a rifle that disassembles and reassembles with the same easy mechanism. Flashlights are useful for everything from finding your favorite pen that rolled under your desk to spotlighting suspicious-looking corners and people. It’s hard to find a flashlight that can do it all, though. At the same time, you probably don’t want to carry more than one flashlight. Unfortunately, many of the flashlights available now use complicated mechanisms for you to choose from available modes – either multiple button taps to remember or twisting and untwisting the bezel to program your preferred modes. 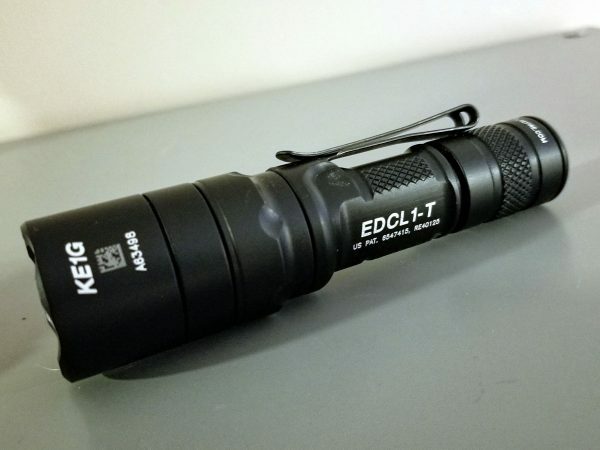 The new EDCL1-T from Surefire solves this with a simple “gas pedal” switch: press it lightly for a task light, or mash hard on the button to turn it all the way on. The switch is entirely momentary-on; if you stop pressing the button, the flashlight turns off. If you need the light to stay on, you can twist the bezel for constant on. Flashlights that are super bright have historically been fairly large. The EDCL1-T takes only a single 123A battery, so it’s small enough to fit comfortably even into girl pockets. That doesn’t mean its top output is dim though. It packs 500 lumens into its brightest mode, with a beam that’s focused enough to be blinding. Galco makes several high quality basic holsters, and one of their long-standing designs has been the Quick Slide. The original Quick Slide was a basic leather outside the waistband holster intended to be worn on the shooter’s strong side and carrying a gun with the muzzle pointing slightly backwards. It had two integral belt loops and only covered the gun across the trigger guard from one belt loop to the other, leaving the muzzle free and the holster able to accommodate different length slides in otherwise identical guns. The Quick Slide Gen 2, as shown at SHOT, adds several small updates to modernize this classic. 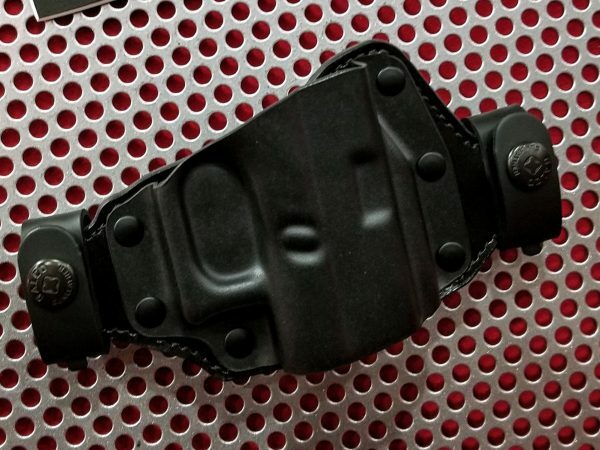 While quality steerhide is still used on the back side of the holster, the Gen 2 now incorporates Kydex for the “click” fit now preferred by many shooters. It’s also mounted so that the gun is carried with a straight, vertical drop, though the overall coverage and open muzzle design remains about the same. The integral loops have also been replaced by leather snap loops that allow the wearer to take the holster on and off without having to deal with threading a belt. 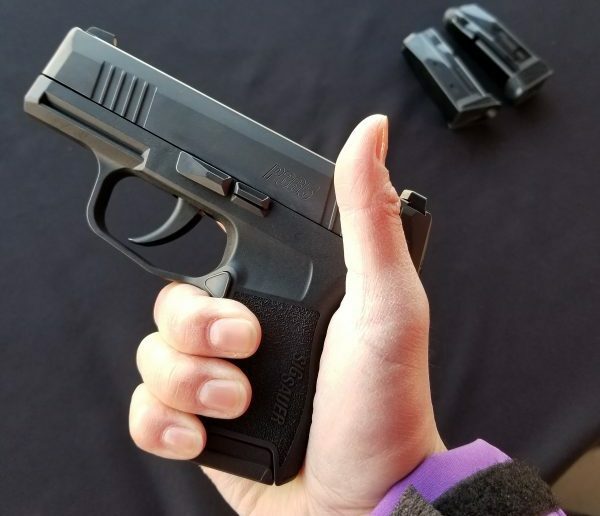 Sig’s P365 as one of the more popular handguns at this year’s SHOT Show. This micro-compact 9mm is gives you an impressive 10+1 capacity while also having an overall length of 5.8” and a width slightly above 1”. The P365 is a striker-fired pistol that combines the power and reliability of the 9mm with the size of a pocket pistol. It’s lightweight, balanced, and sits nicely on your hand. Plus, it gives you two more rounds than its competitor, the M&P 9 Shield M2.0. The reception of the P365 has been overwhelmingly positive, making it one of the most-talked-about handguns of the New Year. If you’re looking for a new gun for conceal carry that isn’t bulky and uncomfortable, the P365 is perfect for you. Overall, it’s safe to say that the Sig P365 has successfully changed what we’ve come to expect from compact handguns. Used to, we had to choose between lower-power calibers or low capacity. But with the P365, we get the best of both worlds. If you’re looking for a gun to keep you safe during the zombie apocalypse or the collapse of modern society, there’s no better weapon to protect your home with than Mossberg’s 590M. This pump-action 12 gauge shotgun looks and functions like most other Mossberg shotguns, but with one twist – it’s got a detachable, double-stack magazine. 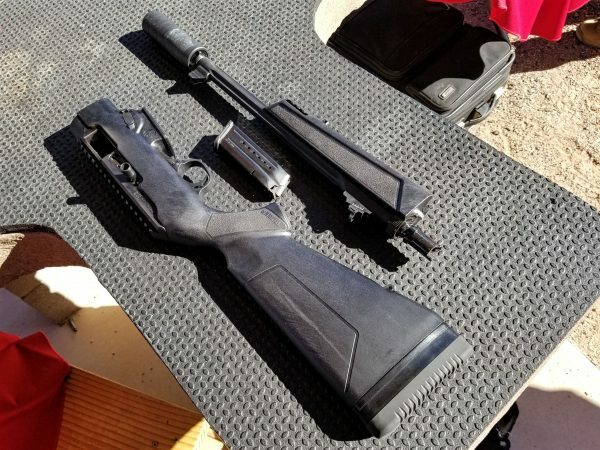 That’s right, Mossberg ditched the magazine tube and opted for something a bit more tactical and way more effective for any home-defense scenario. The Mossberg 590M is available in 5, 10, 15, and even 20-round magazines. Before you go out and buy one of these 20-round bad boys, make sure to check your state and municipal laws beforehand. But even if you are in a place that restricts you to one of the smaller magazines, you’ll still find that shooting and reloading with the 590M are much more effective than shotguns with traditional tube magazines. If you want to learn a little more about the 590M and see in action, take a look at this short video clip. I’m a big fan of wheel guns. I know that they’re more of a niche these days, but there’s a satisfaction that I get from shooting a good revolver that I just don’t get from other guns, so you can imagine how excited I was when I first saw Taurus’ multi-caliber Model 692 revolver. As you can see, it’s a mighty fine looking revolver. 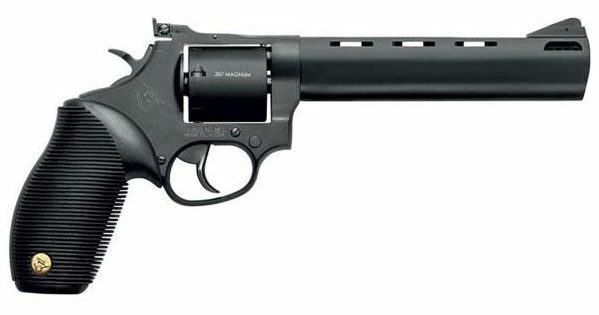 And I know that not everyone loves Taurus, but I’ve never had any problems with my Model 431. I have faith in Taurus, when it comes to revolvers at least. Now, you might have noticed that I haven’t even talked about the caliber of this gun yet. That’s because there isn’t one single caliber that the Model 692 fires. It actually supports three calibers: .38 Special +P, .357 Mag, and 9mm. Switching calibers is as simple as swapping out the cylinder. I really like the versatility of this gun. Being able to switch between calibers makes it a great piece to take to the range for the afternoon, and its comfort and low-recoil design also makes it a nice gun to have for home defense. 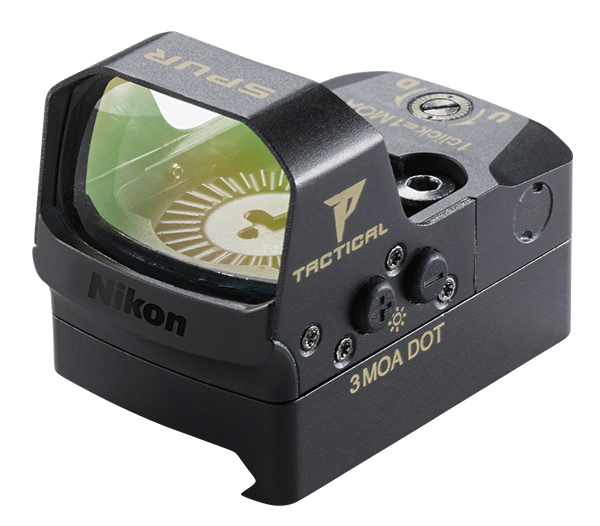 The release of the P-TACTICAL red-dot sight shows that Nikon is making big moves into the optics industry. This lightweight red-dot sight works like the best of them, making it a great addition to your trusty turkey hunting shotgun or carbine. It’s a highly durable piece that is waterproof and able to withstand more than its fair share of knocks and bangs. It also is able to run for 15,000 hours on the same battery. By now, you’re probably wondering what’s so special about this optical. After all, it sounds like every other good red-dot sight out there. However, selling for around $220, Nikon’s P-TACTICAL red dot is significantly cheaper than the other quality optics on the market. In other words, this sight gives HOLOSUN prices with ultra-premium features! When it comes to tactical makeovers and all-around badass rifles, the big boys supporting AR-15 and AR-10 cartridges tend to get all of the love. With the release of the Precision Rimfire, 22LR enthusiasts are also able to get some tactical love. Don’t believe me? Check out this video. The Ruger Precision Rimfire is a fully decked-out bolt-action rifle that comes with an adjustable buttstock, a Picatinny rail system mounted on top of the receiver, and a free-float Magpul M-LOK handguard made out of a high-quality aluminum. The Precision Rimfire also comes with either a 10 or 15-round detachable magazine, a ½”-28 threaded barrel for suppressors and other muzzle accessories, and the same easy-to-operate bolt handle that comes with other Ruger Precision Rifles. The 10/110 BA Stealth Evolution is one of the newest rifles produced by Savage Arms. Not only is this one of the coolest looking guns at the SHOT Show, it’s also one of the hardiest. Just because the 10/110 happens to be pretty doesn’t mean that it can’t handle its own at the range. This gun was designed to withstand rough use and was put through countless stress and torture tests in its developmental stage to ensure that it’s tough and reliable. This is my all-time favorite new gun and I really hope IWI does this right. The leak and recent press release is giving me hope. If you don’t know me, I love shotguns and I write about them as much as the editors will let me. The Tavor TS 12 is a bullpup, high capacity, semi auto shotgun. The TS 12 doesn’t use magazines, but rather a rotating tube system. You have 3 magazine tubes and each can hold 5 rounds of 2¾ inch shells. When one magazine tube runs dry you switch to the next. It’s not clear if the gun is auto indexing or manual, but I’m excited to find out. The overall design looks like something out of Starship Troopers and to me, that’s not a bad thing. The TS12 is a cool looking little shotgun that’s bound to make some waves. I’m hoping IWI doesn’t keep us waiting for months and months to get hands on with the TS 12. Its apparent MSRP is $1399.00, which puts it in the Benelli category of expensive shotguns. For this price, it better run like a Benelli, too. What is it about wood furniture on ARs that just does it for me? The combination of retro style and modern rifle just blends so beautifully. 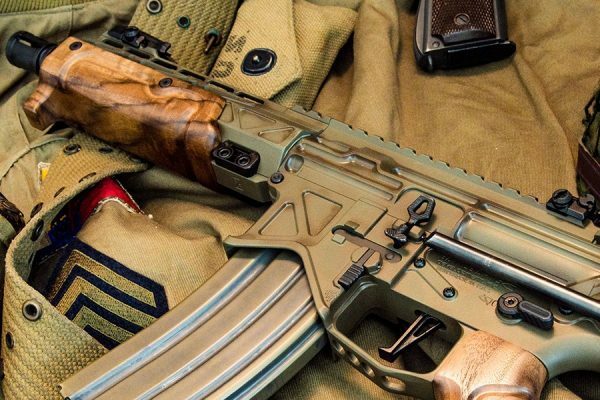 The Battle Arms Development Paratrooper is probably the most modern AR-15 varient to be outfitted with wooden furniture and it’s drop dead gorgeous. 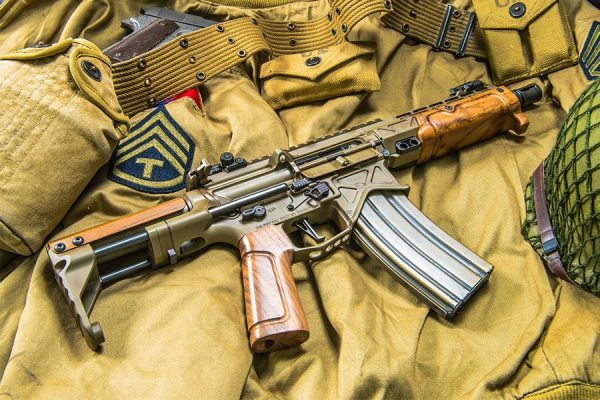 The BAD Paratrooper is an SBR that features a wooden handguard, wooden pistol grip, and a wood accented PDW style stock. The billeted upper and lower receiver has a dark earth tone finish and the custom billet design almost makes me drool. The rifle is chambered in .300 Blackout so the short 7.5-inch barrel is perfect. Is there a practical purpose for me to want this rifle? No, not at all. But look at it, it’s a thing of beauty. This isn’t the only gun Battle Arms Development makes, and I could certainly choose almost anyone of them for this category. 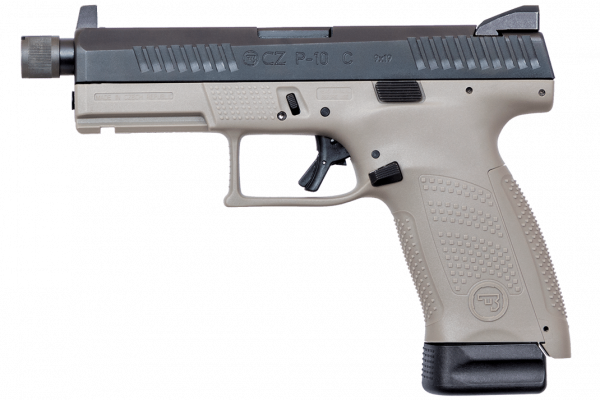 The CZ P-10 C made a big splash at last year’s SHOT Show. The gun has gone on to be quite successful, and has gained a great reputation. The trigger is fantastic, the bore axis is lower than most, and the gun was compatible with most Glock 19 holsters. This year, CZ is expanding the line with two new models that both look interesting. CZ may not be the most popular brand, but they listen to their customers. The new P-10s show that. I’m a huge CZ nerd. Seriously, I love them. I hang around CZ forums, and I see what people want, and CZ delivers. The first model is the P-10 C Urban Grey Suppressor ready model. 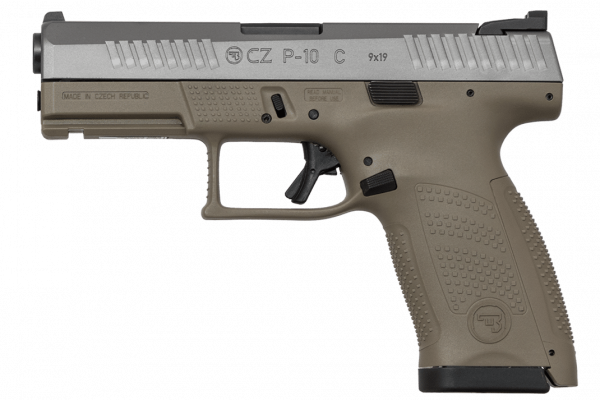 You may remember last year CZ released the Urban grey models of the P09, P07, and the SP-01. This year the P-10 C is getting the same treatment. The barrel is threaded, and the gun is equipped with metal suppressor height night sights. Toss on your can of choice on and hit the range. Speaking of cans, apparently CZ is getting into that business too. The next model is the white nitride FDE model. I’m torn. I love the white nitride look, but would rather see it on a black frame than a FDE frame. Either way the white nitride looks awesome, beyond stainless steel in terms of cool factor. Oh, and this model will have Tritium night sights. 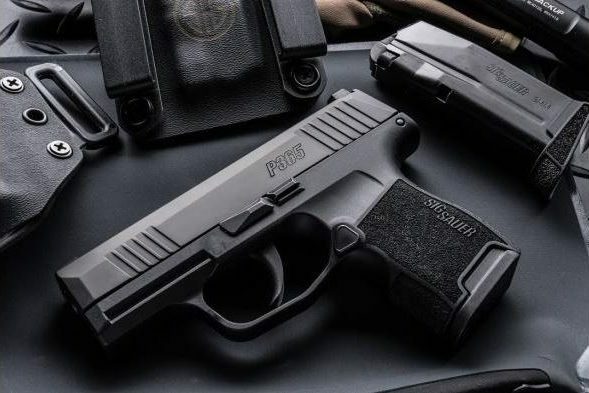 The second official day of SHOT show last year, it was announced that SIG had won the MHS competition and the P320 would be the Army’s new handgun. The SIG booth was all smiles and I asked a rep when would we see a M17 for the civilian market, but all I got a vague look and an even vaguer answer. Well, less than a year later, the M17 has made its way to SIG’s catalog. The SIG M17 looks interesting. It features a manual safety, a plate system to change the sights, and, of course, it’s FDE. 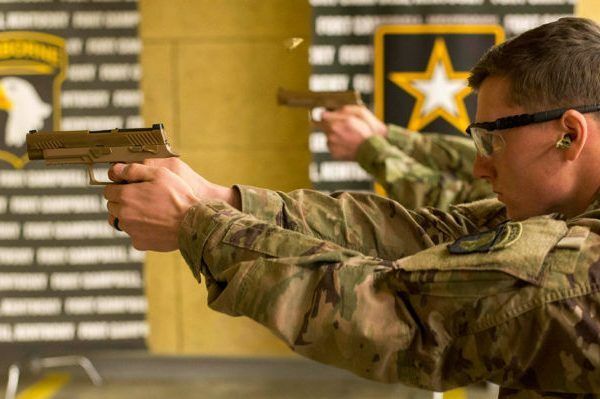 The Sig Sauer M17 is the US Army’s New Standard Issue Side Arm. On the opposite spectrum, we have the new SIG P365. This subcompact pistol is Glock 43 sized, with nearly double the capacity. SIG also invented some new magazines for the gun, which has made everything slimmer than ever. The SIG P365 is designed to be carried at any time or place, and that’s where the name comes from. It’s small, but filled to the brim with 9mm. Finally, this better pan out. PSA basically announced via AR15.com that they were doing an MP5 something or other. They posted images of a rough receiver with the promise to know more at SHOT. If PSA can deliver an MP5 clone for less than a grand they’ll capture the market, and if they can follow it up with a reliable and affordable source form gas, they’ll rule it. Right now even Turkish made MP5 clones are going for more than a 1k. PSA also needs to ensure it works. Let’s be real: when PSA reaches outside their usual AR 15 realm, there tends to be issues. However, they also announced that they are working with PTR. PTR makes fine HK G3 clones, so maybe that’s where this started from? That wraps up the things we’re excited for (so far). What guns and gear are you looking forward to this year? Let us know in the comments below.